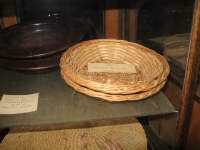 Description Two woven baskets used by Englewood Christian Church. Used for bread. Early 1900. COPYRIGHT INFORMATION ~ For access to this image, contact the Museum.